Could it be true? Or is it BS? Pro Tuning Freaks posted about it too, it's legit. PTF says they'll be posting up more info soon. I hope it's true! The factory flash and internal fuel limiters have really been holding up our B48/B58 JB4 development. My car could definitely use a few more hp. Once one company figures it out, it won't take long for BMS to follow I'm guessing. I can see some other tuners being able to flash the ecu on the b48 and now on the mini b38. The mini b38 flash went to 284 hp and 400 nm from stock 192 hp. With the JB4 max hp on map 2 was 236. Anyone heard any more updates....? Just follow Wrench Studios, A2 Performance, and HC Performance on Instagram. They're all working on it together and posting teasers almost daily. Wrench Studios supposedly has a b58 testing right now. hey looking at getting flash tuning tomorrow with some local shops that work with tuners in UK, they have stage 1 which is supposed to be 260hp and stage 2 which is 280 hp, looks like stage 1 is running about 18-19 psi and stage 2 is about 20-21 psi. They quote 1.5 bar for stage 2, which does seem high. Also I do not really understand why they quote 310hp for B48B (330i) variants and 260hp for stage 1 on the B48A (120i) I have, I was under the impression they were the same mechanically, maybe not? I do know that the TMAP is limited to 1.5 bar on mine and that would limit it, that could be part of the limit, does the B48B/C not have this 1.5 bar TMAP if so how they get 310 hp would surprise me without METH. my question is should I get the higher boost stage 2 tune or stage 1 and just stack boost on top of that with JB4? when stacking can JB4 also reduce boost form the flash or only add boost? mission performance is doing full b58 flash tunes currently. Im sure all the rest are not far behind. Just in time for the new Supra/Z4 to arrive and breath further life into the B58 flash-tuning market. is that wheel or crank numbers ? On the B48 we made ~270hp at the wheels on JB4 map2 with 91 octane with minimal effort. Easily 280-300whp in there with a little more boost and octane. First thing you have to realize about these flash tuners, they just make up horsepower numbers. Until you see a dynojet showing the power at the wheels from the car whatever numbers they quote are worthless. Any dyno numbers NOT from a dynojet are also worthless. Once the car is tuned post a log on JB4 map0 (flash tuning) and let's see how they have set it up, and how we can use the JB4 to add more power and/or make the tuning better. Any dyno numbers NOT from a dynojet are also worthless. What if a before and after is done on the same dyno on the same day? The raw numbers aren't directly comparable to a dynojet but it will show the delta. eg. I flashed between stock and tuned while still strapped down and went from 300 to 390whp on a dyno dynamics with a stock M140i. 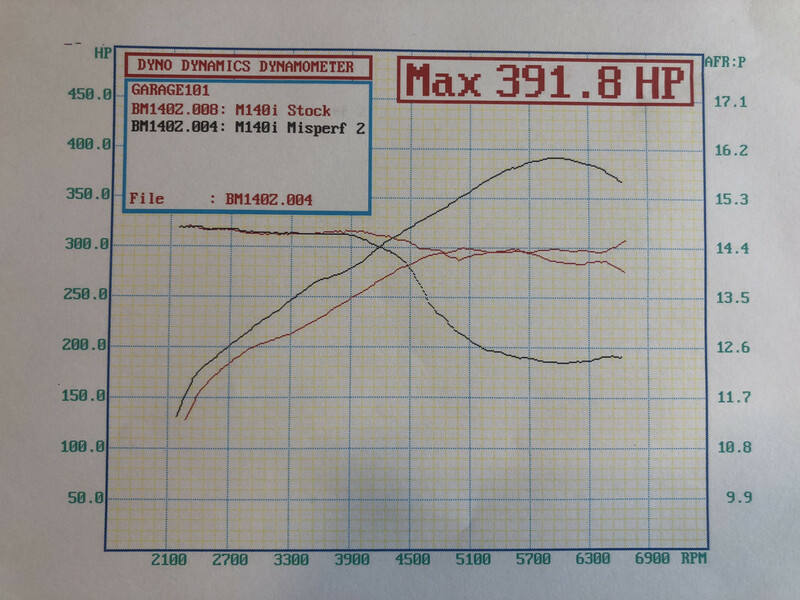 We did 330whp on stock M140 on a dynojet. And 371whp with jb4 map2 on stock car. 98 eu ron. That's on Australian 98 ron, Mission Performance tune. 4) Timing lower, 6 deg at 6k RPM, 5 deg at 5k, at 20 psi. Down form 12-15 deg! yet power is same or better, it looks like my 20i engine had way too much timing for the boost I was running. B38 runs on the grand tourer and I had mine Dyno at 286 with 400 no torque.